I wanted to do this since long. 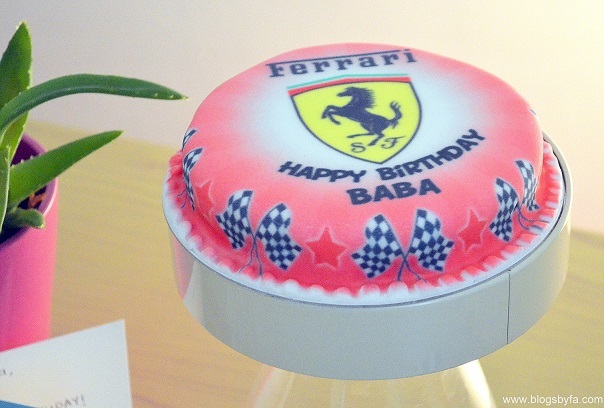 A personalised Ferrari themed cake for the special one on his birthday. 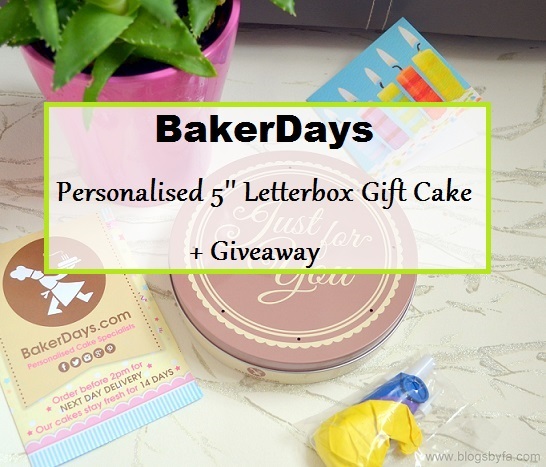 In this post, I will share my experience with the BakerDays personalised 5 inch letterbox gift cake and a giveaway for you lovely people, so make sure to read till the end! Oh, and have you read my previous posts? Then you would know what's going on at my end nowadays. Yeah! It's my husband's birthday month. Catch up with the birthday dinner post, here. Seriously, one of my FAVOURITE restaurants for high-end dining in London. Check it out or you will miss dining at this very posh eatery that gives you a feeling of being royal. It was such a delight to be sent a personalised cake. I love personalised things. Not only do they look pretty but they just melt the (at least, mine) heart. BakerDays is a Personalised Celebration Cake Specialist, providing quality personalised cakes for all occasions. The delicious range of recipes and sizes are available for delivery 6 days a week. And wait, if you order before 2:00 pm, BakerDays can deliver the very next day! 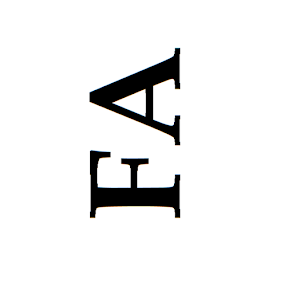 YES, you are reading it right! The Letterbox Cake is the baby of the BakerDays family. Being just 5” in diameter, it fits perfectly through the Letterbox allowing you to surprise anyone with the most delicious personalised gift. You can check out the BakerDays website here, or visit and follow them on their Facebook and Twitter pages. The BakerDays cake arrives in a white thick card board box and the cake is further secured in a nice metal box to ensure that your personalised 5'' letterbox cake reaches you in good condition. 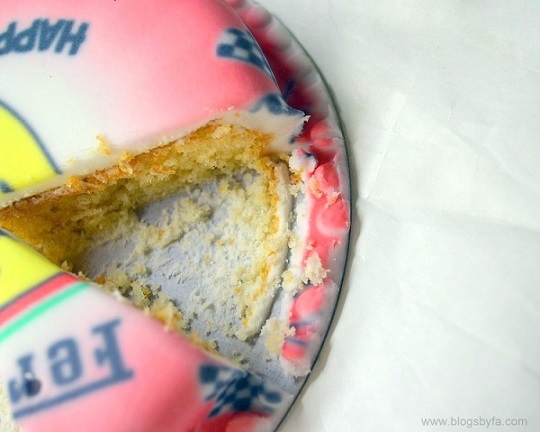 Frankly, when I had heard of the BakerDays letterbox cake, I wasn't much sure about how the condition of the cake would be when it would arrive at my door-step. However, it was in the best condition and I was very happy to see it. Other than the cake, there is a small 3 inch card, a packet of 3 decent sized balloons, 2 candles and a party whistle blower. That was actually a surprise because I wasn't expecting all that. 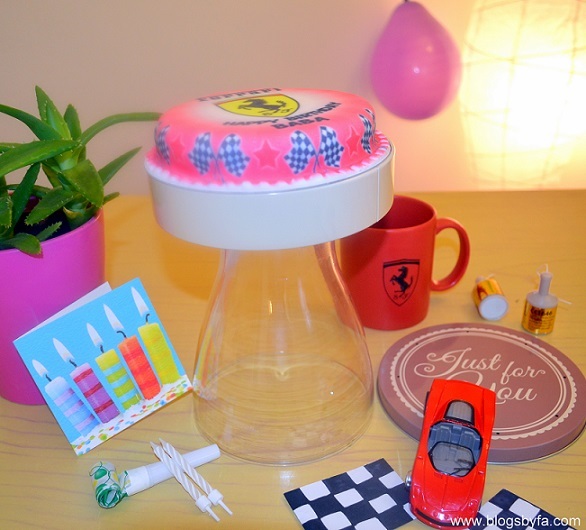 So, it is a whole mini birthday celebration package which seemed perfect for me because that's all I was looking for. I selected a cake from their website and provided my own photo and text to be printed on the cake. P.S. The cake was on behalf of BabyN' for his dad whom he calls Baba (meaning dad). I have taken a photo of the box for you so you have an idea of how the BakerDays personalised letterbox cake arrives. This cake was vanilla sponge cake and it tasted good and so was the fondant. However, you can also order chocolate chip sponge cake, gluten wheat free cakes, dairy free cakes and fruit cakes. The vanilla sponge cake I tried costs £14.99, while there is an additional charge for the other flavours. The cakes are posted through the Royal Mail and an additional postage charge applies depending on how urgent you need the cake to be delivered. For all the details, you can check on the BakerDays website. Although it's meant to be a letterbox cake, your house may have a different sized letterbox like mine which may not enable the post-man to keep the box in your letterbox. In that case, if he rings the bell and you receive it, it's well and good. However, if the postman leaves a note for collection or re-delivery, you might not be very happy about that. Therefore, I would just advice you to inform the BakerDays team to convey to the Royal Mail to deliver the parcel at the neighbour's in case you're not around rather than leaving a note. I haven't forgotten the GIVEAWAY. So HERE it is! Now this calls for all the excitement? You just have to ENTER the Rafflecopter and I'll select a random winner and announce/contact the lucky reader on social media. So make sure you following me there! The giveaway was a huge success. Thanks for all the entries. There were 1078 in all and HERE is the WINNER! 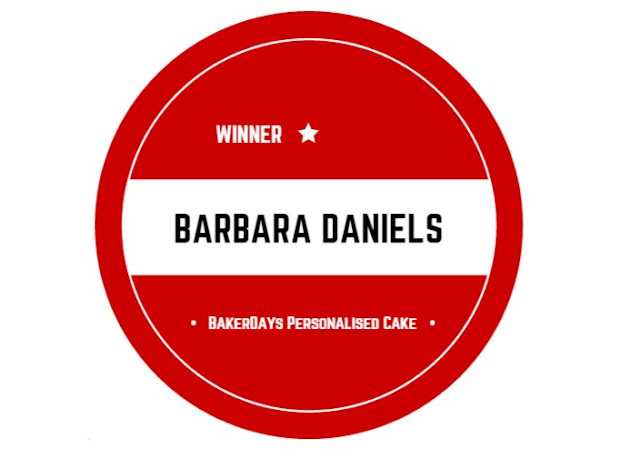 Congratulations to Barbara Daniels of UK. Well done! Have you ever ordered a personalised cake for someone special? What was their reaction when they received it? The cake was sent for review by BakerDays, it is an honest review and all the views are my own. This is a collaborative post and the competition is run and supplied by BakerDays. All responsibility for the competition in terms of the prize is on them. Open to UK & Ireland residents only. This looks so cool! What an incredible looking cake! give it to my partner to celebrate his 50th then help him eat it ! This sounds like a really cool service. I'd love to have a specially designed cake delivered to my house. I love getting involved in fun stuff to win. I hope I win. I never win anything. How convenient is this! You can never celebrate a birthday without a cake and this one is a winner, without a doubt. I like that you can personalize it, so the celebrant feels more special! Absolutely! It gives a personalised touch. A personalized cake, what a lovely touch! The next day delivery option is a nice added bonus. Hope Baba enjoyed it! What a cute way to make a day special. I like the size and the fact that it can be delivered in your letterbox. Yes. The size is perfect for a small family or 2 people. It serves 4-6 people. Maybe I can do an international giveaway some time later. 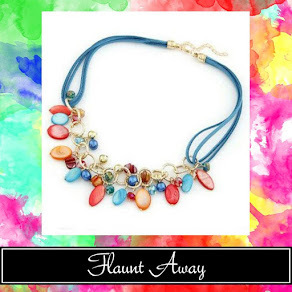 Hope you've entered the giveaway! What a great idea, marketing-wise! And a perfect time-saver, or last-minute gift! So true! 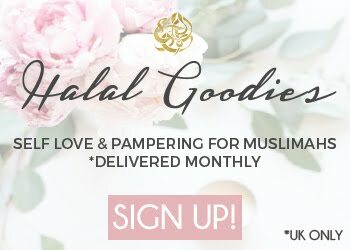 Perfect for someone like me who prefers things delivered at home especially if it's to surprise someone. Sounds perfect! That's a dream cake for a boy! Especially if you are a Finn and a fan of Kimi Räikkönen :D. It's always such a lovely idea to make (or even order) a personalised cake. It gives that little extra for the day. What an amazing idea! I like the whole concept! Btw. What an incredible looking cake! I see the first time something like this! Awww the cake is so cute, I would love to try it. Looks delish. MaashaAllah looks neat & colorful. I would like to gift this to my 2 yr old son on his birthday. This cake looks super cute! Sponge cakes are so delicious. Something about the bouncy texture makes me so happy. I love sponge cakes too. I would send a cake to my son who has left home. Omg how amazing is the cake. I've never heard of Bakersday but sounds amazing. Will be checking them out asap! And now I am hungry! These all look delicious. My son would love the Ferrari one! O yes! I guess boys love all kinds of cars. 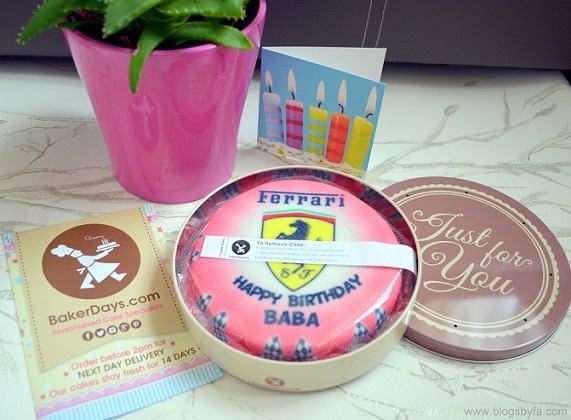 This Ferrari cake looks so cool and delicious! I am sure your hubby would have loved it! Eat it! lol I would love to get one for my partners birthday they are so cool! This cake is so cool! With personalisation, the possibilities are endless. I'm really impressed by the quality too! Yes please. Do share with the lovely lady. I would give it to my wife for her birthday. I'm all about creative cakes. This absolutely a fabulous designed cake, I bet the taste as fabulous it looks. 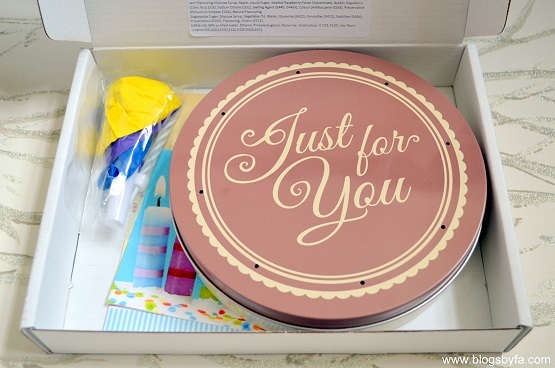 Personalized cakes are common in our part of the world, but delivery is limited to a very large quantity. I find the Ferrari theme cool! Personally I will share it among family. That cake looks beautiful! It's a piece of artwork. Helpful review, too. I might just have it for myself as it is my birthday this month. I would share it with family! I would get it for my mum. I would send my son a congratulations cake for passing his exams and getting a job that he has been after for ages. I share it with my housemates! I wouldn't have a choice in the matter! I'd share it with my mum, just because she's wonderful! I would send it to my mum for her birthday! She always makes everyone a cake but rarely gets one herself! It's my daughter's 30th and she has just been diagnosed with coeliac disease, so I would get her a birthday cake she can eat. Surprise my cake-loving husband with it. It's my daughters 9th birthday in August so I would send her a cake! She loves post and cake perfect combo! My good friend's birthday in 2 weeks! As it is my birthday this Monday I would keep it for myself and share with my Fiance. My daughters birthday in 2 weeks, this would be fab! Good luck for your daughter's results. Give it to my Mum for her birthday. Unfortunately I missed the give away oh well may be next time. By the way Vanilla sponge cake is one of my favourite ♡ x! Oh sorry about that. There is another giveaway LIVE on my Instagram. You may participate in that one.